Caia Diepenbrock is an artist, designer and life-enthusiast originally from Rhode Island with newfound roots in Los Angeles, CA. 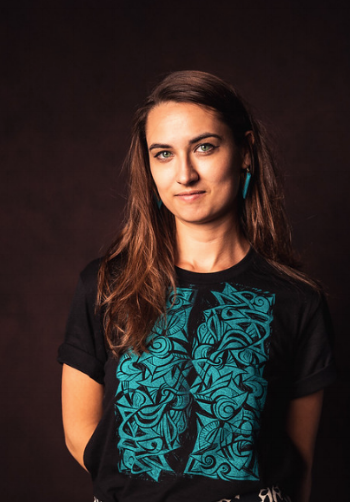 She received her Bachelor’s Degree in Studio Arts from Bard College and is now working in the film industry as art director, scenic painter, and set decorator while building her custom Wearable Art brand, SpiralEyez Designs. Caia art directed the critically acclaimed docu-drama The Infiltrators which won both the Sundance NEXT Audience Award and the NEXT Innovator’s Award. It has been touring all over the US at various film festivals and was rated #2 in best documentaries of 2019 by Thrillist Entertainment. It has been gaining press for its incredible story about undocumented Dreamers and its rebellious exposure of for-profit detention centers in the U.S.
Caia has worked on numerous music videos as scenic painter, set decorator, and set dresser as well. Looking forward to our next project together! Also check out Spiral Eyez Designs, Caia’s custom clothing brand.